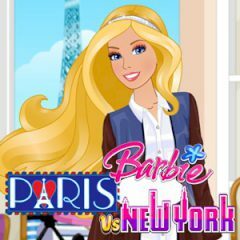 Barbie is going to show everyone the difference between the fashion in Paris and New York. Despite the fact, that pretty and vogue girls dress similar, each region has its own preferences in fashion. Barbie will figure out which exactly! Barbie never misses a chance to see and learn something new, but to achieve that she needs to travel a lot. Well, she is happy about that for sure. Everyone likes to travel, but when Barbie goes abroad she gets more that any other person. Compare two fashion styles and see where people dress up better: in Paris or New York?